I remembered the excitement I had felt after reading the Robert Harris book. How it was thanks to Alan Turing, principally, that the Enigma machine’s secrets were exposed. Basically, significant figures in the German army would have an Enigma machine, for all the world like a tricky-looking typewriter. They would hit a key on the front half of the keyboard, which would light up a letter on the back end of the keyboard. In this way, a coded sentence would be generated. This would then be sent to another German officer who also had an Enigma machine, and when he fed the code into that, it would reverse-code it back to the original meaning. Three wheels at the back of the machine, which turned every time a letter was punched, meant the substituted letter was never the same twice. Their starting position controlled the letter chosen to form the code but that starting position was changed every day at midnight. That meant that you could spend all day cracking a message, only to have all your work rendered useless on the stroke of midnight. Luckily, the Allies knew two things: that a letter could never substitute for itself (an “e” would never be “e” in code) and the Germans always started their nightly broadcasts with a weather report. These, clearly, followed a pattern, and with the help of the giant proto-computers that Alan Turing designed to make calculating the possible letter combinations more achievable, they eventually cracked the code. The Allies had to use their information sparingly: they did not want the enemy to know that their top secret coding machines had been compromised. Imagine knowing that your warships were being targeted by U-Boats, and not being able to issue a warning to take evasive action, for fear of giving the game away. Heartbreaking. I was enchanted by the story of the Enigma machine, and how Alan Turing and his team shortened the war by at least two years, or perhaps even won the war for the Allies. The way he couldn’t live his life after the war as he may have liked as a gay man is beyond sad, but it’s the combination of his great intellect, how he put it to such invaluable use and how shamefully he was treated afterwards that I find so impossible to resist. It also piques my interest. I have a latent interest in the world of maths: I am a sort of ignorant enthusiast, with a tragically weak capacity for serious mathematical thought. That doesn’t mean maths doesn’t excite me. Occasionally, I have attempted to help the children with their maths homework. This causes my husband Marcel huge alarm. He is very good at maths in a truly maths-geek way: it’s his job, after all. Eventually, finding me spouting on in a confident but confused way, he could not hold back. At that, we all fell about laughing…how can you take that seriously? But the fact of the matter is that I am intrigued by maths. One day many years ago in Belfast, I awoke with a hangover. The house I was in belonged to a statistician named Malachy, and I suppose he was into maths as hobby. There was a book lying around the living room called Mathematics For The Millions and it promised to address all the questions to which I wanted answers: how folk realised you could count up to more than 3, how whoever thought up logarithms did so, how calculus works. But in my compromised state, it was all a bit too much. Luckily, the proprietor of a second hand bookshop in Belfast City Centre, later on that day, was on hand to help me. “Mathematics for the Millions, by Lancelot Hogben? Yes, I have it,” he said in a charming Northern accent, disappearing into the dark recesses of aisles of dusty tomes, reappearing with an old green book smelling deliciously musty. It remains one of the books I intend to take with me to a desert island, should the need arise, but not until then. 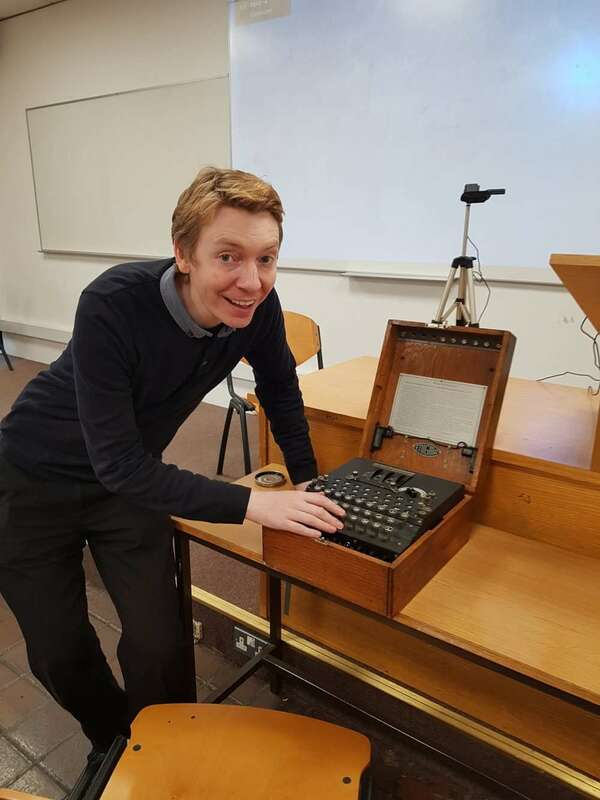 This is all by way of explanation as to why I was so excited to hear that the Enigma machine was in Galway for a few days. I arranged to sketch it, which time was afforded to me most generously. I spent the most wonderful two hours in the company of James Grimes, sketching the machine, and generally shooting the breeze. It felt like – it was – a huge privilege to have a private audience with the machine, and indeed with James. Two things made me wonder. Why, when the Germans realised someone knew their moves in advance did they assume there was a spy passing on secrets, and not consider that their machine might have been compromised? Okay, I could see how that might have happened. But what about the fact that there were Enigma-type machines, used by banks and the like, freely available before the war? Why not just buy them then, and decipher how they worked? James didn’t have much of an answer for that. 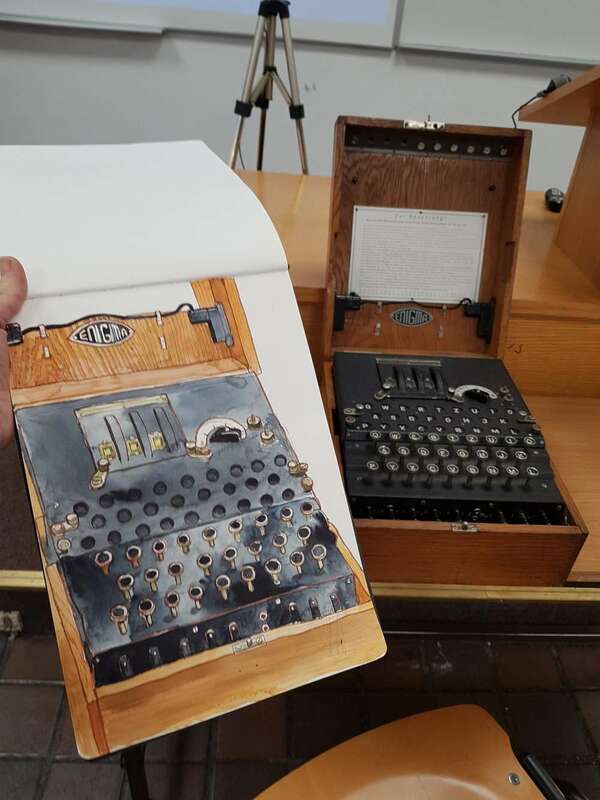 Sketching the Enigma machine will remain one of the high points of my life this year (two of my men friends suggested running off with it; just as well James watched me like a hawk!) – I’m going to re-read Enigma by Robert Harris. Perhaps this time around I might even understand it. What do they say about a roomful of monkeys and an infinite amount of time…? – Using colour to create more depth and the role of warm and cool colours to convey distance. – How to develop a daily sketching habit – paring down your kit, setting aside specific times? – Gimmicks (my word!) to make sketches look cool! Thank you! So cool to get both the fab drawing and the wonderful background! Someday I hope to come to Ireland and take one of your classes!! Giving any end of May or middle of June. I’ll be in France in between, visiting daughters family while they are nearing their year of living in Tours, Fr. Oh I’d love to have seen that beauty of a machine in person! Despite everything, it’s a real testament to human ingenuity and also a valuable piece of history! Awesome stuff! Luís you are so generous with your comments. Thank you so much. I agree with you totally that it’s an incredible testimony to human ingenuity. In fact I wish I’d said that!! Wow wow and wow! The sketch and the narrative… I am going to get the book from my library. I did see the movie with Benedict Cumberbatch which was well done except for the terrible way they penalized Alan Turing for his sexual orientation.